Are you a sucker for emotional commercial? I am! This one from Smart Money Padala tugged my heart. It's amazing how time has changed. When I was young and my dad was working abroad, Mom had to borrow money for many of things that we needed for emergency just because remittances weren't as fast and as reliable as they are today. Mobile banking wasn't even existing back then. When you need immediate cash advance, you can't do anything. Now, it's as easy as texting! Blame it on the pregnancy hormones that's got me extra emo these days but I'm slowly changing the way I look at things. It's amazing how can carrying a child inside you can make you a totally different person. I've been less outgoing, more caring about what I eat, more aware of other people and even the state of my home now is different. I guess you can consider me on the way to domestication, settling into my new role as a wife and as a mother. Although I am still the Shen that is crazily addicted to beauty products, I have changed quite a bit and makes sure that I balance my expenses properly. After all, the husband and I have been living independently for the past 5 years. One thing that I haven't gotten use to is the tiny loss of independence. I use to be able to do a lot of things on my own! I can go out whenever I want. Do grocery, pay for my bills, and so on. Now I can't simply run to the bank to pay for bills, or go out do errands. Given my burgeoning belly, I have to take extra care and have to things from home as much as I can. That's when friends introduced me to SMART Money. They thought that it'll make my life easier as a pregnant woman who clearly has a lot on her plate and help maintain her independence. After all, being in Smart means freedom and being able to take control of your life. Of course I gladly signed up for one. It's a re-loadable cash card that is like an ATM and Debit Card but can be accessible and managed using your Smart miobile phone. So if you're a smart subscriber (prepaid and postpaid alike), you can have a Smart Money! It allows you the convenience and security of a regular Mastercard holder, while able to receive text notification for every Smart Transaction. Meaning, your account is safer than ever. What can we do with Smart Money? Want to try it sending money using SMART Money? SMART has a simple simulator that you can try! click here. With a speed of text, receiving money from your loved ones abroad is easier. Smart Money has 95,000 partners agents worlwide (Moneygram, NCB, QuickPay, PLDT Remittance, Western Union) that makes it easier to send money to their loved ones here in the Philippines. 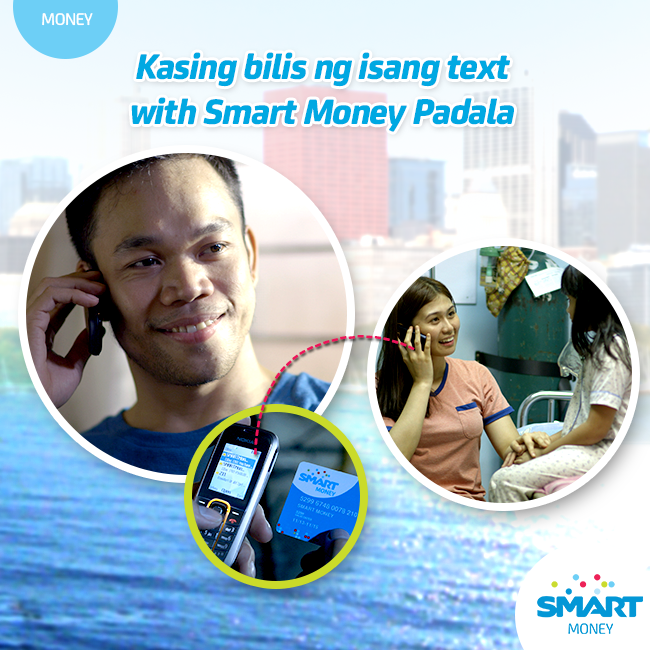 I can pay our Meralco, PLDT, Smart bill, Water bill and insurance using my SMART Money. :) For complete list, click here. I transact with several banks in my area. BDO, Metrobank, BPI, Asiatrust, BDBP, RCBC, Allied Bnk, Asia United Bank, Citystate, Security Bank, Sterling Bank of Asia, Chinatrust. All that's Bancnet. Get your SMART Money today. :) click here!